Packing Standard Export Packing: Cotton & PP Film, Accept Customized Packing. Warranty 5 years on metal frame, 3 years on springs, 1 year on trampoline mat and soft pad. Remarks Free designs as long as given the sizes. Beslepark is a professional factory, we have a strong designer team, our trampoline products are sold all over the world. If you are interested in our products, you can contact us directly, we can offer everything for your demand. Advanced equipment with good workmanship assure the high quality, all goods are well packaged and will be installed for the test before shipping. combined with the indoor playground, spider tower, cage ball etc. a. Installation: Professional CAD instruction or arrange professional staff install the trampoline. below are installation example. b.we will provide 5% extra spare parts for customers for replacing. c. We promise to pay all the shipping cost for miss-delivered parts. (1) What service does Beslepark offer for creating trampoline park? Beslepark is a factory but offers one-stop service. Apart from manufacturing trampoline equipment, we offer free 3D design, business plan advice, franchise opportunity, installation, aftersales, etc. as well. (2) How can I place the order? What safety standard does your trampoline meet? Do you have any certificate for the material use? Our trampolines are designed and manufactured to meet the guidelines of ASTM, and the material used is certified. (3) What will my park cost ? or what cost should be included in my budget? The cost of the trampoline is based on the design, but we may offer an estimate for you. 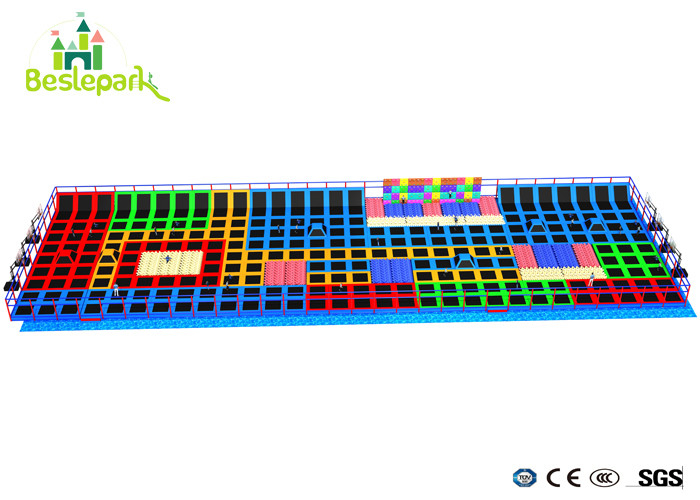 And you will then have additional costs for your ancillary areas (lockers, reception, café, toilets etc. ), decoration such as wall art, marketing plan such advertising and any services you require (lighting, heating, air conditioning). (4) How much space do I require to operate a trampoline park? We would recommend 6500 to 20,000 sq ft (600 to 2,000m2) or more to provide the optimal experience to your customers and financial payback to the operator. Remember that trampoline activities will typically comprise between 55% to 70% of your total floor area with the rest being used for ancillary activities such as café, viewing, reception etc. (5) Is it easy to install the trampoline? Do you offer installation service outside China? We will provide detailed and professional instruction manuals for you. And yes, we can send our installation engineer to work with your teams. The cost of installation service includes the daily salary of the engineer ($110 per day), round-trip tickets, accommodation, etc.